The trickiest and most important part is the plywood. 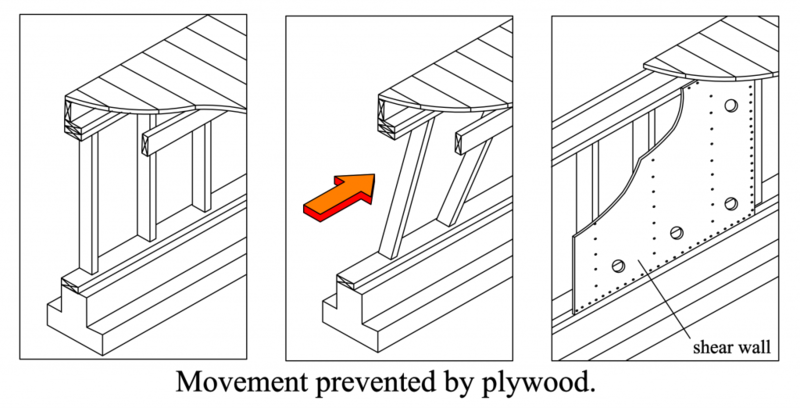 The most important factor in a retrofit is the plywood’s ability to resist earthquakes. The type of nails or staples used, their size and length, plywood thickness, the species of wood, the manufacturing of the plywood, and the wall framing all play a part in its performance. The table below is from APA Research Report 154. 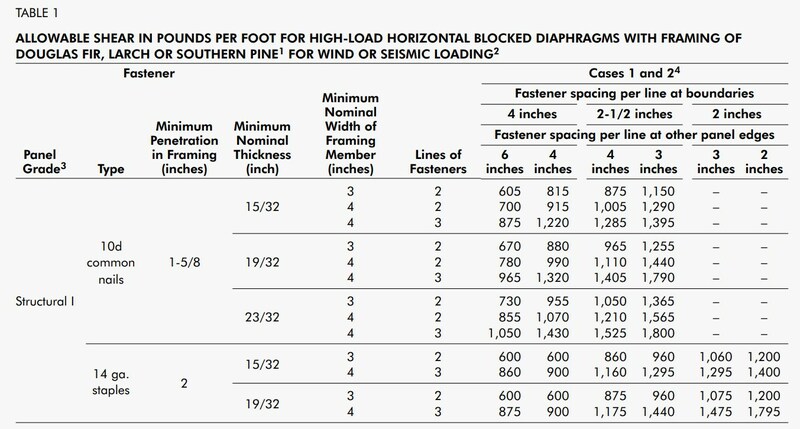 Table 1: Earthquake resistance of plywood varies according nailing and type of plywood. The purple boxes call attention to differing strengths in plywood based on plywood nailing and the type of plywood used. 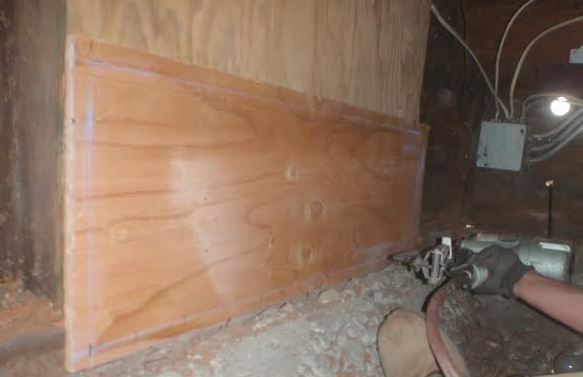 In one case, the plywood can resist 200 pounds of earthquake force per each linear foot when 5/16 plywood with 6d nails penetrating 1-1/4 inch into the framing are spaced 6″ apart on the edges. Or 870 pounds per linear foot with 15/32 (half inch) plywood with 10d nails penetrating 1 -5/8 nails into the framing and spaced 2″ apart. Below are some more detailed instructions on how to read this important table. (5) The plywood is nailed on the edges 6″, 4″,3″ or 2″ apart. 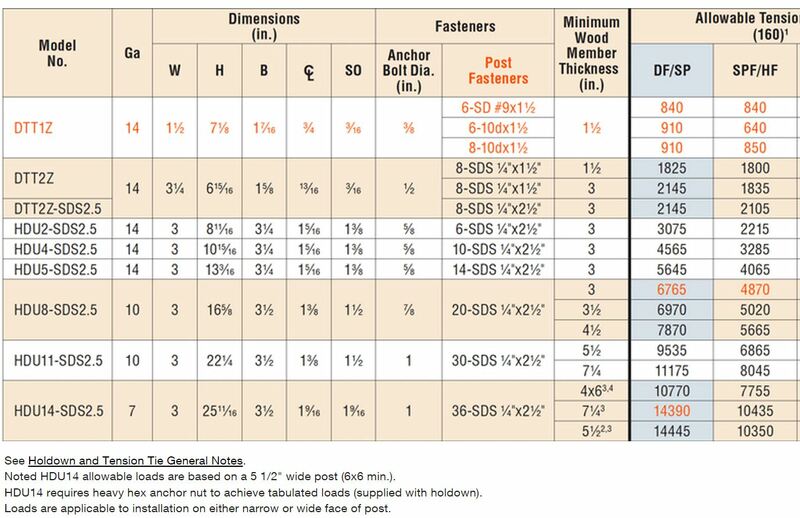 In this case we get different strengths, for example a shear wall will have 430 pounds of resistance per linear foot if the “Nail Spacing at Edges” is 4″ apart with 8d nails and 870 pounds of resistance when nailed with 10d nails 2″ apart. What kind of nailing would you want for your house? These higher capacity shear walls are not always feasible, and only the retrofit professional who has evaluated the conditions of your house can make that determination. The best plywood in a seismic retrofits is called Structual 1. It has been specially formulated to brace walls against earthquakes, including cripple walls. The closer the nails are on the edges of the plywood when nailed to the 2 by 4 wall framing, the stronger the plywood will be. 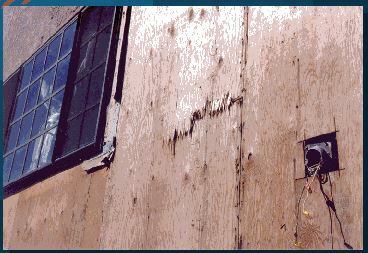 All retrofit guidelines require nailing that is 4″ apart, even though plywood nailed at 2″ apart makes the earthquake resistance of the plywood 58% stronger. 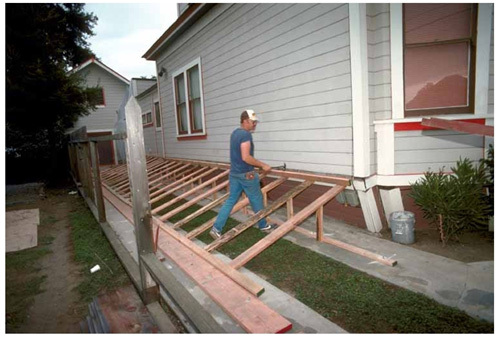 Depending on how your retrofit was designed, your proposal may mention that the plywood will be nailed 2″ apart. It is very clear that these guidelines only allow this low strength plywood nailing. These guidelines recommend the use of the Nailed Blocking Method. Because these blocks split so readily it was decided that no more than 4 nails would be allowed for each block. Each nail can resist 117# of force. Multiply that by 4 and you get 471# of resistance. There is no point in nailing the plywood such that it exceeds the strength of these blocks. It was therefore decided that 8d nails would be spaced 4″ apart which provides 484# of resistance per linear foot. An almost exact match. 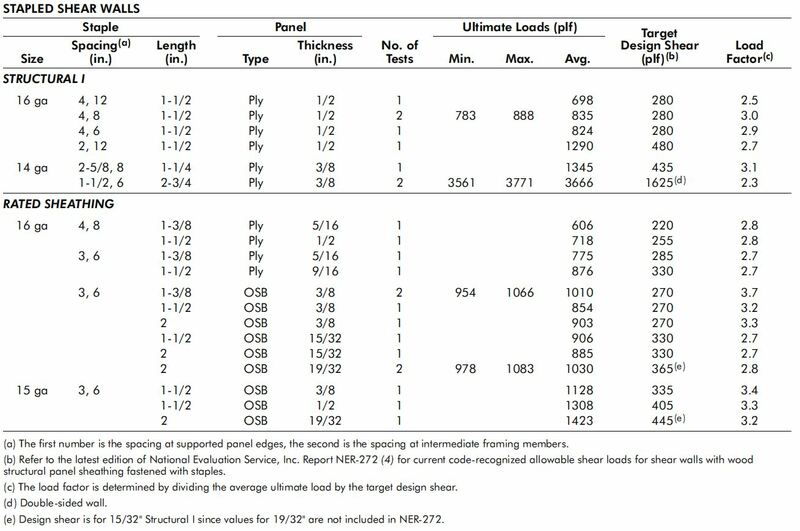 APA Research Report 138 : describes tests prove show very high strength shear walls can be produced by using multiple rows of nails or staples in wood framing that is wider than the normal 1-1/2 inch wide framing used in new construction. The capacity of staples shear walls is at the bottom of this Table. As you can see a shear wall built in this way can resist 1795 pounds of earthquake force and represents the strongest shear wall ever tested. Even though it has never been tested, a two sided shear wall of this type could have an enormous ability to resist earthquakes. If old growth lumber is used even closer spacing of staples can provide an almost limitless shear wall capacity. The next consideration is uplift or overturning forces. High capacity shear walls must resist a tremendous amount of overturning. For example, if the shear wall can is resist 1900 pounds per linear foot of lateral earthquake force, it will also need to resist #15,200 pounds of overturning force. For this reason proper sizing of hold downs is critical. Under Model No. is the name of the hold down. Staples not create high capacity shear walls, but if spaced close enough together they are extremely stiff. This can be useful when designing a shear wall that will be working in tandem with other shear walls made of a stiffer material such as plaster. Older homes were built with old growth Douglas Fir and redwood that was centuries old. 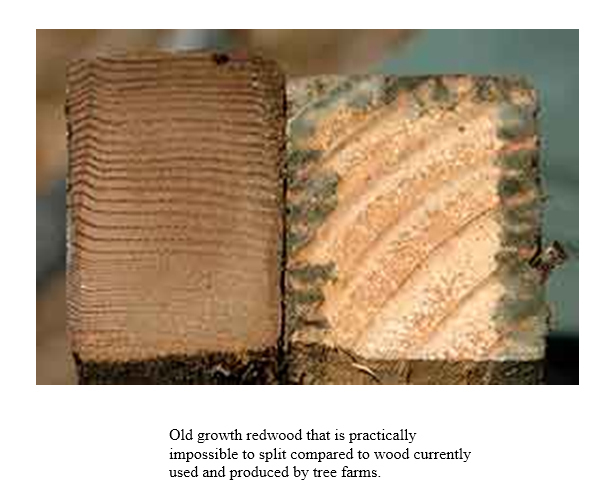 This wood has very different properties compared to wood grown on modern tree farms. The old wood is much denser and is very difficult to split compared to tree farm lumber. For this reason the retrofit guidelines found in the International Existing Building Code, the Bay Area.s Standard Plan A, Seattle’s Project Impact,and the Los Angeles Retrofit Building Code only allow 8d nails spaced no closer than 4 inches apart. 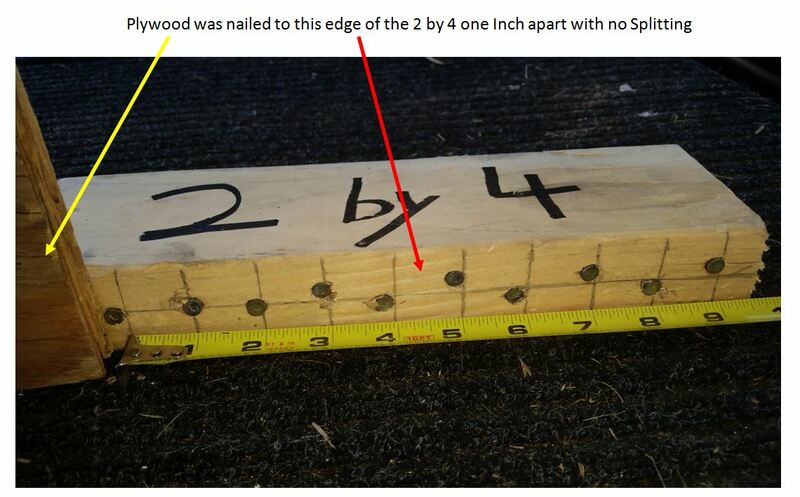 Old growth lumber should always be used whenever possible because it can easily be nailed with larger 10d nails 2 inches apart on the edges without splitting. If the initial shock does not collapse the cripple wall, an after shock might. In the photo below, a man trying to prevent his already leaning cripple wall from fully collapsing in an after shock. An aspect ration is the ratio between the height and the width. For example, a shear wall that is 8 feet long and 4 feet wide has an aspect ration of 2h/1w (the height is twice as long as the width). To use the values listed in the shear wall tables above, a shear wall must have a 2/1 aspect ratio or less. If the aspect ratio is greater 2/1 but less than 3.5/1, the per linear foot of earthquake resistance of the shear wall must be reduced by what is called a reduction factor. This maximum 3.5/1 aspect ratio translates into an 8 ft. shear wall 27.5″ wide. Any narrower than this and you have a post. 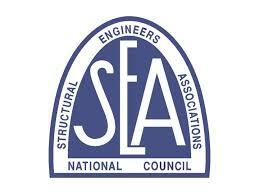 The way you figure out the aspect ratio of a shear wall is to divide both the height and the width by the width. For example: if a shear wall is 64″ high/18″ wide, we divide both the height and the width by 18 to get a ration of 3.5/1. If the wall is 96″ tall then 96″/18″ = 5.3/1. This is a post and not a shear wall. Once we determine the aspect ratio, assuming it is less than 3.5/1, we use a reduction factor of twice the width 2w/h (height). 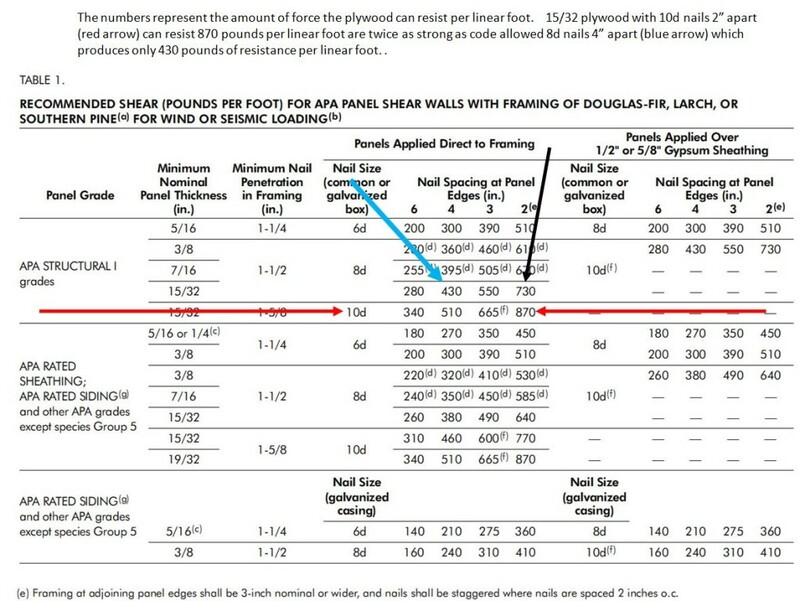 So if we have a shear wall that is 96″ tall and 32″ wide the reduction factor is twice the w/h = 2 x 32/96 = 0.666. The allowable shear in the table is multiplied by this factor to get the reduced shear capacity of the narrow wall.